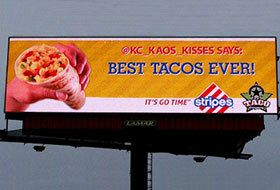 Stripes Convenience Stores knows customers love its takeout tacos. So when it went looking for a way to share that enthusiasm with a wider audience, it chose a novel approach: Using digital billboards, streaming their Twitter comments for all to see. "Stripes really wanted to push the envelope," Ian Dallimore, digital strategist at Lamar Advertising in Baton Rouge, La., tells Marketing Daily. "It wanted to communicate with consumers and let them know that the company is listening to them. They said, 'Let's have our customers write the digital copy through tweets.'" 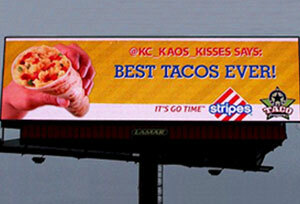 The campaign, created by Firehouse Agency in Dallas, invites fans to tweet what they love about the tacos. 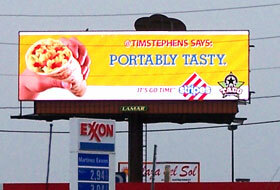 Tweets, which go through a filter at Lamar to keep conversations G-rated and pro-Stripes, are then streamed onto eight digital displays in the Corpus Christi, Brownsville/Rio Grande Valley, Laredo, Lubbock, Midland/Odessa and San Angelo markets. The billboards are on surface streets near red lights, so people have a chance to read them, he says. The tweets run from lunchtime until midnight, he says, and for the record, he insists that such campaigns don't inspire people to text while driving, and that viewers understand the feed isn't live. "Nowhere do we ever say 'tweet to the board now.'" He says it's not clear yet whether the campaign, which ends March 3, is sending more people to Stripes, or to eat more tacos while they're gassing up, but that the chain should have a sense of effectiveness next month. "In this social world, it's a different way to use old school billboards for branding," he says. "We feel like this is just the beginning of what's to come."